Money well spent! 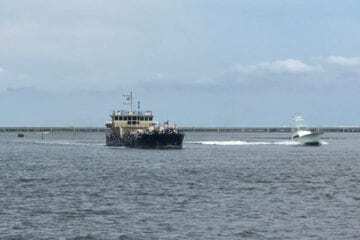 Tax revenues generated by the offshore fleets, commercial fishing boats and the Oregon Inlet Coast Guard will help to offset the expense. In addition, local mariners will benefit with safer and more consistent passage through Oregon and Hatteras Inlets. The idea of a side caster is a bad idea, it places the sand at the edge of the channel and it float’s right back in as gravity and the current changes! @ Slappy – the service men and women who work at the Oregon Inlet CG facility live in our communities and pay taxes, own homes, buy groceries, etc. Not a huge impact, but it all adds up to help alleviate the costs. I’m with you though, it would be interesting to see how much tax revenue is generated annually from all interests utilizing the inlets.